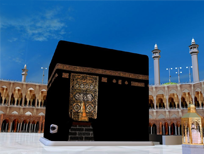 Bookings for Hajj - 2015 are closed. We offer our sincere and heartfelt thanks to all those who chose us to help them undertake the ultimate Pilgrimage. We can only hope that it turned out to be as holy and fulfilling for you as it was for us. Congratulations to all those who are going to perform Hajj this year. Hajj, is a magical experience. One that is capable of changing one’s life. All we ask for is to play a small part in bringing about that change. And so, we are striving, even as you read this, to improve on and offer many more spectacular & enchanting Hajj experiences in the years to come. Please stay tuned to our website regularly to avail of the fruits of our efforts for 2016.
for atleast 6 months from the date of travel.